Network members may create events through groups to help organize and/or publicize actions. Events may be classified in two ways: public, so all network members see them, or private, so they are visible only to group members. All events may be viewed and searched from the main menu on the left. When the Events page is selected from the main menu, a page opens showing one or two event lists. Featured Events are events visible to all network members. 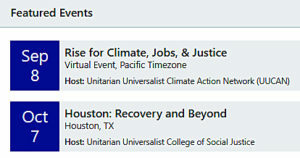 If you have RSVP’d your intention to attend an event, it will appear in a second list, My Upcoming Events. Public events may be searched using the orange button on the upper right of the main Events page. Click the orange button and a form appears, with search fields including the event name, description and interest tags. At the bottom of the Search Public Events window is a button to click to view all public events scheduled in the near future. Events also appear on each member’s personal Dashboard page. Select which list you wish to view. Featured are public events are public, and Attending are events to which you have RSVP’d. Events also appear within the Groups page in which they are created, via the blue menu at the top of group pages. When an Event is clicked, its details appear including where and when it is, who is hosting it and who has RSVP’d. Members may RSVP to any public event or events created within their groups. Locate the event you wish to attend, then adjust the toggle switch to indicate your intention. If you choose Attending, this event will turn up on your Dashboard when you select the Attending setting on the Events panel and on the My Upcoming Events list on the main Events page. This will now show up on your events tab on your Dashboard as an event you are attending on the right side of the page. It also will appear on the Events page, under My Upcoming Events.